Minister of Information and Culture, Alhaji Lai Mohammed while addressing journalists over the situation of abducted schoolgirls in Dapchi, Yobe State. The Federal Government has released the names and full details of the 110 girls who are yet to be accounted for, following the attack on the Government Girls Science and Technical College (GGSTC), Dapchi, Yobe State. The schoolgirls went missing after the attack which occurred on February 19, 2018. 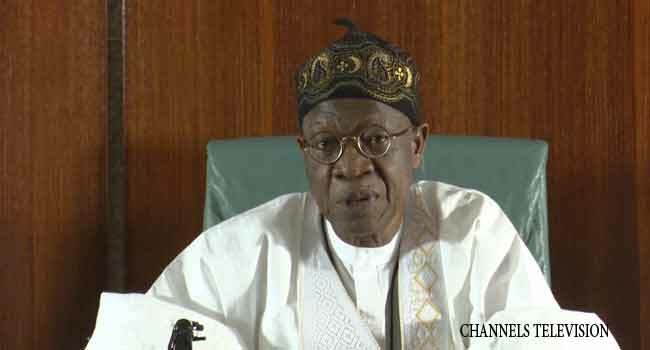 The list was contained in a statement issued in Abuja on Tuesday by the Minister of Information and Culture, Alhaji Lai Mohammed and made available to Channels Television. Parents of the missing schoolgirls had earlier on Saturday released the list of the girls yet to be accounted for. The list by the parents contained the names of 105 schoolgirls. Mohammed, however, in the statement containing the list of the missing girls said the list was handed over to him by the Yobe State Government. The list contains the name, age and class of each of the 110 students. According to the list, out of the 110 missing girls, eight were in JSS1, 17 were in JSS 2, 12 were in JSS 3, 40 in SS1, 19 in SS2 and 14 in SS3. The girls’ ages range from 11 to 19 years.